When Gia Montgomery's boyfriend, Bradley, dumps her in the parking lot of her high school prom, she has to think fast. After all, she'd been telling her friends about him for months now. This was supposed to be the night she proved he existed. So when she sees a cute guy waiting to pick up his sister, she enlists his help. The task is simple: be her fill-in boyfriend— two hours, zero commitment, a few white lies. After that, she can win back the real Bradley. The problem is that days after prom, it's not the real Bradley she's thinking about, but the stand-in. The one whose name she doesn't even know. But tracking him down doesn't mean they're done faking a relationship. Gia owes him a favor and his sister intends to see that he collects: his ex-girlfriend's graduation party — three hours, zero commitment, a few white lies. Why do I want to read this book? Oh, let me list the reasons... On the Fence, Pivot Point, Split Second, The Distance Between Us! Read and loved all of Kasie's books - and I know I'm not the only one! Sadly, I haven't read anything by Ms. West yet. 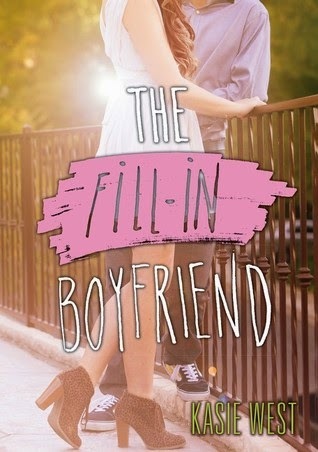 The Fill In Boyfriend sounds like a fun read. I'm adding this one to my Goodreads list. Awww, you should, Marilyn! I highly recommend On the Fence. Me me me me me! Count me in too! I'll ready anything she writes!! Best pick!! Right!? I hope we love this one too! Nice pick! Just saw this some blogs back. Not my kind of read but I do hope you positively love this one! YES!! Kasie West is one author in my auto-buy list! Cannot wait for this one! You should! I really like On the Fence. But this oneeee omg! Great pick, I also can't wait for this one! Love the premise and cover! I loved On The Fence!!! I'll have to check this one out. Thanks for sharing about it. Here's my WOW if you'd like to stop by! I hope you enjoy this one, if you read it! I am a huge fan of Kasie Wests' other contemporaries. I will definitely have to pick this one up! Yes! I hope you do! A contemp pick for your WOW Alyssa? Yay! I love Kasie West, so excited for this! Right?! LOL! I hope we enjoy this one, Nereyda! Me tooo!!!! Hope you get a chance to read it soon. Thank you - and you too, Brandi! You're not the only one! I can't wait to read this. Hope you love it when you get the chance to read it! Lisa is so excited for this one! I have not read any Kasie West yet *hangs head in shame* but I just got several of her books for Christmas and can't wait to read them! Me too! I hope you love it, Liza! This is not really my kind of read, but I do know a lot of my students like this kind. I've seen it around on a lot of blogs for this week. Thanks for visiting my post earlier! You should give it a shot, Lisa! I'm not either! But Kasie West is amazing. I'm always up for more Kasie West, can't wait! Great pick, Alyssa! January 2015 New Release Giveaway! Science in Fiction: An Introduction!